Parker Vector pen set from the 1990s. Green, brown, and tan camouflage that we believe is the Camo Mark II Woodland. The set includes a ballpoint pen and a mechanical pencil that takes 0.5mm leads. New old stock in mint condition. 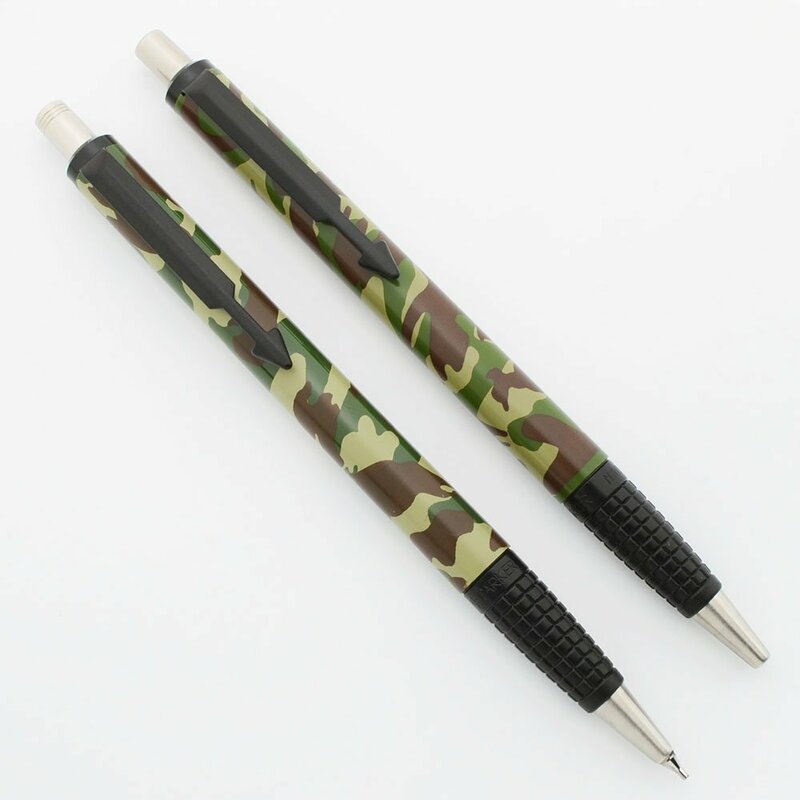 Manufacturer and Year Parker, made in UK -- 1989-93, the Camo Mark II Woodland was introduced in 1989 and the pencil stopped being made in 1993. Length When the ballpoint tip is extended and the pencil and pen are the same length of 5-3/8". Filling System The ballpoint pen takes Parker-style ballpoint refills. A working blue Parker refill is installed. The tip extends and retracts via a twist mechanism. The mechanical pencil takes 0.5mm leads. It has a button at the top of the cap to extend and push in leads. An eraser can be found beneath the cap. Color Camo pattern. There were three Camo patterns and we believe this is the second one generally called, "Camo Mark II Woodland." It is a mix of green, brown, and tan with black grid sections. Condition New Old Stock in mint condition. They look brand new with no scratches, dents, or dings. They are working well.